Many occupations publish a code of conduct to promote professional behaviors among its practitioners. Recently, the Signing Professionals Workgroup released its Certified Signing Specialist Code of Conduct. This article will discuss why the Code of Conduct was drafted, what it covers and how signing professionals will benefit by following it. The Signing Professionals Workgroup published the Code of Conduct for several reasons. First, it is designed to help the SPW’s mortgage lender members oversee and supervise their business relationships with Notaries in a manner that ensures compliance with federal consumer financial protection laws. Second, because signing professionals represent lenders before borrowers, the Codewas drafted to help improve the customer experience at the signing table. 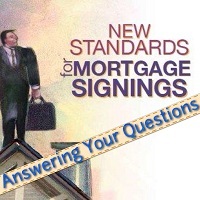 Finally, the Code, along with the Signing Professionals Workgroup Signing Script, forms the basis for questions that will comprise the annual Certified Signing Specialist Examination currently under development. The Code covers the responsibilities signing professionals must fulfill in the context of a signing services assignment, from the qualifications to be a Certified Signing Specialist and to the shipment of the signed loan documents to the lender or closing agent at the end of the assignment. The Code is divided into 10 sections or “Guiding Principles.” These Principles outline the essential duties of the Certified Signing Specialist in broad strokes. They include protecting confidential customer information, reporting illegal and suspicious activities, demonstrating professionalism with borrowers and contracting companies, charging and collecting fees for services, advertising and remaining impartial in conducting an assignment, among others. Since signing professionals also notarize documents at a loan signing, Guiding Principle Two prescribes that Certified Signing Specialists will follow all laws, rules and best practices that apply to the notarizing of closing documents. The 103 Standards of Practice more concretely specify the duties of the Certified Signing Specialist. There are as few as four and as many as 18 Standards of Practice organized under each Guiding Principle. What’s In It For Signing Professionals? It is common for companies providing assignments for signing services to have their own codes of conduct. Since signing professionals work for many different companies, it can be unnecessarily burdensome to remember Company X’s code for an appointment at one hour of the day and Company Y’s for another immediately following. The Certified Signing Specialist Code of Conduct was published with the goal of being used by all companies hiring signing professionals. This will make it easier for signing professionals to meet the expectations of all their lender and contracting company clients. In addition, the Code may be cited as the basis for why a signing professional chose to act a certain way if there is an issue. For example, if a borrower complains to the lender about the professional showing up late, the professional can respond by saying that he or she called the borrower 30 minutes prior to the appointment to inform the borrower that traffic would prevent her from arriving on time as Standard 9.13 requires. Used in this way, the Code can be used to demonstrate and justify a signing professional’s professional conduct. Bill Anderson is Vice President of Legislative Affairs with the National Notary Association. Bill-I saw you speak at Northern Cal Escrow Assoc this meeting and didn't have a chance to ask for a copy of your presentation. How can I get a copy? Really enjoyed it! Hello Ms. Tarr. I forwarded your message to Bill Anderson and he said that you can obtain a copy of his presentation from Vicki Nott. Thank you for your interest!